TransDevelopment was turnkey, design-build general contractor for an $11 million bulk unloading terminal in Westborough, Massachusetts. The 25-acre terminal features six unloading tracks with a capacity of 140 railcars. The facility is master-planned to accommodate an additional 60 railcars on three future tracks. 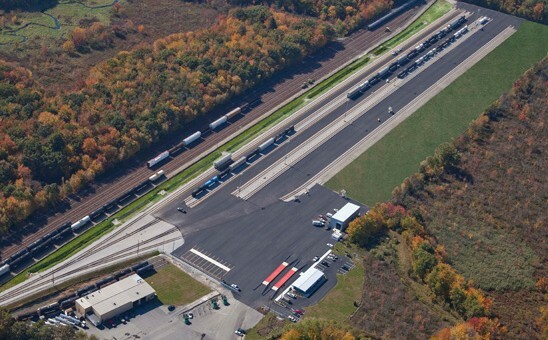 The facility is TRANSFLO’s main terminal serving the Boston area. The project is a leader in green development strategies for new rail terminal facilities. The facility is located on a former automobile transfer facility. This location had existing roadway access, rail connections, and support track infrastructure in place, which minimized environmental impacts due to land disturbance and material sourcing. The finished project features less impervious area than the pre-development condition. In addition, the project features an innovative system to contain any hazardous material spills and prevent any impacts offsite. All train-to-truck transfers occur in an impervious facility area, which is drained using controlled outfalls. The project was completed in 12 months.